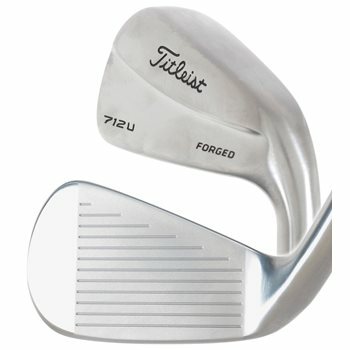 The Titleist 712 U utility iron is a chrome plated satin fish club and features a forged 1025 steel body that is hollow and has a welded, thin, high strength, 455 steel face insert. It is a great long iron replacement for the higher speed, forged blade player. It features a deeper CG for more trajectory control and more stabibilty (higher MOI) compared to the MB and CB irons. The wider sole is more effective from a variety of attack angles and it has a preferred look over cavity back long irons with more offset. This utility iron gives the player the clean look of an MB/CB iron, but provides added confidence with a slightly larger profile. Review by GW, 2 years ago.